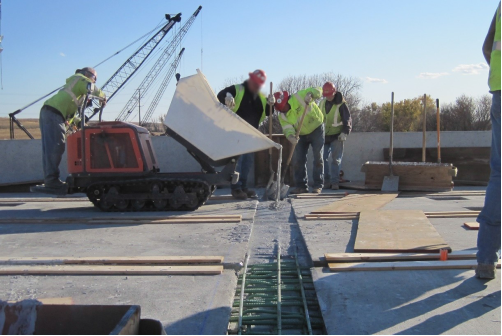 The increasing use of accelerated bridge construction methodologies has led to widespread use of PBEs, in which the structural components of the bridge are fabricated offsite/nearsite and assembled in the field using field-cast grout connections. (1,2) These connections are a critical item in the construction and the long-term performance of the bridge and must be robust, durable, and efficient. However, some PBE connection details have been linked to constructability and serviceability problems. Many times, these issues have been attributed to less-than-desirable performance of the field-cast grouts, particularly for connections located at the deck level. A photographic example of one type of PBE connection being completed through the casting of the grout is shown in figure 1. If properly designed, fabricated, and constructed, the grout materials used in these connections provide superior performance and thus complement the long-term durability aspects of the overall structure. Specifications of grouts used in these applications share common properties such as the need to demonstrate self-consolidating characteristics, high early age strength, good dimensional stability, and good bond to the concrete element. There are different types of grouts that can provide most of these properties; however, the term “conventional non-shrink grout,” commonly used in contract plans, is often too broad of a term and does not necessarily result in the specification of the desired materials properties. From a long-term durability perspective, simply specifying the use of a “conventional non-shrink grout” introduces much variability in the materials that can be used, which can lead to unintended performance outcomes. These grouts have sometimes exhibited dimensional instability due to the rapid rate of (inherent) shrinkage and the presence of expansive agents to try to counteract most of that shrinkage. It is not uncommon for connections using these grouts to exhibit cracking and subsequent leakage either through the grout itself or at the interfaces between the prefabricated component and grout. This cracking is indeed recognized as being linked to the shrinkage that these grouts exhibit during the first days and weeks after casting. The ASTM C1107 test method (Standard Specification for Non-Shrink Packaged Dry, Hydraulic-Cement Grout) describes methods through which cementitious grouts can be tested. (3) This specification focuses on criteria to ensure that cementitious-based grouts achieve a minimum strength and that the expansion is below a maximum limit. However, the specification lacks a clear presentation of shrinkage limits and does not address the need to recognize the compatibility of the grout with the surrounding materials (i.e., prefabricated concrete substrate) in which it is placed, the manner in which it is placed, and the environmental conditions that can vary during placement. In these criteria, there is a need to raise awareness among end users about the importance of a proper dimensional stability characterization when considering the use of field-cast grouts for PBE connections. The most common grout type used in PBE connections is based on portland cement or similar cementitious materials. It is generally a mixture of the cement (and other cementitious materials), sand, water, and powder chemical admixtures, and it is commonly referred to as “non-shrink” cementitious grout. (4,5) Other types are also available, such as epoxy-based, fly-ash based, and magnesium phosphate-based grouts, to name just a few. In addition, the use of ultra-high performance concrete (UHPC) in PBE connections has been shown to be a viable alternative solution. (6) Most, if not all, of these grouts are engineered proprietary products that are prepackaged and then purchased by a contractor for onsite mixing and placement/installation. ASTM C1107 covers the material performance requirements of grout-like materials (particularly for NSCGs) that an end user should assess prior to the use or acceptance. (3) The document provides a table summarizing the performance requirements as well as the test methods needed for correct property assessment. The material performance requirements described in that table are as follows: (1) fresh consistency, by methods described in ASTM C1437 and ASTM C939, (2) compressive strength via ASTM C109, and (3) volume changes (in terms of height change) as described by ASTM C827 and ASTM C1090. (10–14) The volume change portion is the focus of this TechNote. ASTM C827 and ASTM C1090 describe how to measure the height change as a function of time for a 3-inch (76-mm)-diameter by 6-inch (152-mm)-tall cylindrical specimen at fresh and hardened stages, respectively. (13,14) While ASTM C1090 limits both the maximum and minimum allowable height changes during the material hardened stage (from 1 to 28 d), the ASTM C827 test method only sets a limit to the maximum allowable height change at the time of final set. These limits are shown in table 1 with “+” indicating an expansion. Table 1. Height change of grouts via ASTM C1107 test. The test methods proposed by ASTM C1107 to evaluate the dimensional stability of grouts or similar materials are probably sufficient to obtain a general perspective of the “bulk” volume changes that one might expect from this type of materials. (3) From a practical perspective, an end user may reject a material that exhibits changes in height values that go beyond the limits specified. However, the tests conducted under ASTM C1107 (i.e., height change) lack sufficient refinement to be able to determine whether the performance of a grout may lead to the generation of strains and stresses within a restrained system (e.g., a connection), which ultimately can lead to cracking and loss of bond. Figure 2. Illustration. The apparatus for early change in height adapted from ASTM C827. Like ASTM C827, ASTM C1090 assesses the change in height as a function of time but does so in a different manner by measuring the distance from a metallic bridge fixture to the top surface of the specimen using a fixed micrometer (see figure 3). (14,13) However, ASTM C1090 also has a shortcoming. This test procedure does not capture the expansion that may occur during the first hours of the material’s properties development due to the presence of a glass plate placed on top of the specimen, even though many of these materials are designed to expand initially to counteract later shrinkage. Also, the common method of measurement using a micrometer is better suited to measuring larger deformations of the magnitude associated with settlements; it lacks the refinement necessary to capture and differentiate the performance of grouts that exhibit greater dimensional stability. Figure 3. Photo. Apparatus for measuring length change in hardened specimen using ASTM C1090. These test methods have the common shortcoming of considering the simultaneous occurrence of several parameters. While the ASTM C827 test method considers volume changes that include expansion (e.g., expansive agents and thermal), chemical and autogenous shrinkage, surface settlement, and plastic shrinkage due to drying of the specimen from the top surface, ASTM C1090 includes the same effects with the exception of plastic shrinkage. (13,14) In other words, ASTM C1090 does not include the effects of drying in its property assessment. Owing to the simultaneous presence of all these parameters, the measurements are primarily useful for comparative purposes but are not useful for quantitative assessment of shrinkage or expansion propensity. In addition, in both test methods, there is always a certain degree of friction between the specimen’s sides and the inner surface of the metallic mold. The degree of restraint varies with the mixture viscosity and degree of hardening (e.g., epoxy-based grouts would exhibit more friction). Because much of the cracking observed in cementitious materials is directly related to shrinkage, proper assessment of this property is vital to ensuring appropriate performance. The following section discusses additional test methods that can be used to assess pure shrinkage and expansion deformations, leading to a more complete dimensional stability characterization. The two test methods proposed by ASTM C1107 to evaluate dimensional stability of grout-like materials provide an incomplete picture of the level of shrinkage that a grout material may exhibit. (3) For instance, neither of these test methods assesses drying shrinkage, which has been shown to often be a major component of the overall shrinkage. To fully assess performance, additional tests are needed. These additional tests should aim to evaluate shrinkage from a more fundamental point of view by directly measuring pure shrinkage and expansion deformations in both sealed (i.e., autogenous) and drying conditions. These curing conditions are important to better capture real-world effects because some of the situations in which the grouts will be placed are enclosed (sealed), while others will be partially exposed to the environment (drying). The proposed additional tests include the ASTM C1698 and ASTM C157 test methods (figure 4 and figure 5). (16,17) ASTM C1698 measures the linear autogenous deformations of grouts or similar materials as a function of time beginning at the time of final set. The material is poured in a sealed corrugated tube that is placed over supports provided with spring-loaded linear variable differential transformers at each end for measuring length changes. Isothermal conditions (i.e., constant temperature) during the test should be maintained. For longer time measurements (e.g., more than 7 d), specimens prepared according to ASTM C157 should be used in both sealed and drying conditions. In this test, a length comparator is used to measure the change in length as a function of time. Mass loss measurements of the specimens should also be taken in both of these test methods. LVDT = Linear variable differential transformer. Figure 4. Photo. 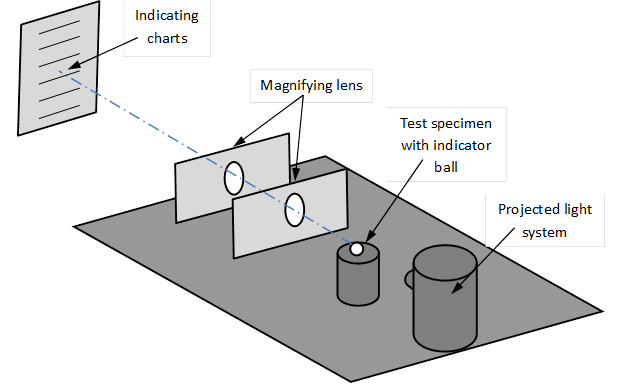 ASTM C1698 test method setup. Figure 5. Photo. Sealed and drying ASTM C157 specimens. To demonstrate the types of dimensional stability results that can be obtained from a variety of materials, a selection of results are presented here. They include results from four NSCGs, a magnesium-phosphate grout (MPG), and a UHPC. Based on the guidelines provided in ASTM C1107, the dimensional stability of these materials should be characterized by both ASTM C827 and ASTM C1090 test methods. (3,13,14) Figure 6 shows the height change results obtained via ASTM C827. As observed, none of the mixtures exceed the 4-percent maximum expansion allowed by ASTM C827 (indicated by a dashed line). However, some of the grouts do exhibit a height reduction. If it is assumed that the requirements of the ASTM C1107 specification do not allow any reduction in height, then some of these grouts exhibiting height reduction would not comply with the standard. Figure 6. Graph. Change in height at early ages measured according to a modified version of ASTM C827. 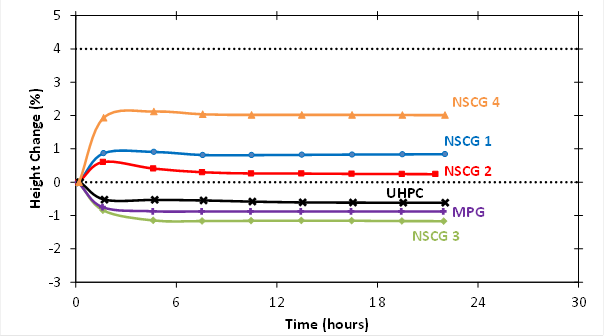 Table 2 shows the height change results obtained for the same grouts during the hardened stage according to ASTM C1090; none of the grouts exhibit expansion, and only one of the NSCG, MPG, and UHPC grouts show height reduction throughout the duration of the test. (14) This standard limits the maximum and minimum height change in +0.3 percent and 0.0 percent, respectively. 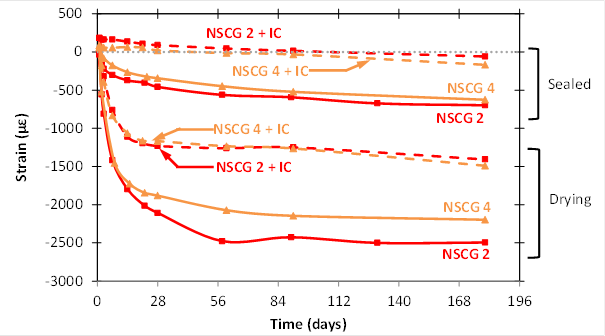 Based on the results obtained from these two test methods, it would appear that at least grouts NSCG 1, NSCG 2, and possibly NSCG4 could be classified as non-shrink grouts. Table 2. 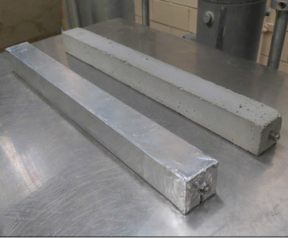 Height change of hardened grouts measured using the ASTM C1090 test. 1Maximum and minimum expansion allowed by ASTM C1090 are 0.3 and 0.0 percent, respectively. If pure expansion and shrinkage deformations are measured in these materials following the procedures described in ASTM C1698 (for early-age assessment) and ASTM C157 (for longer-age assessment), a different response is observed. 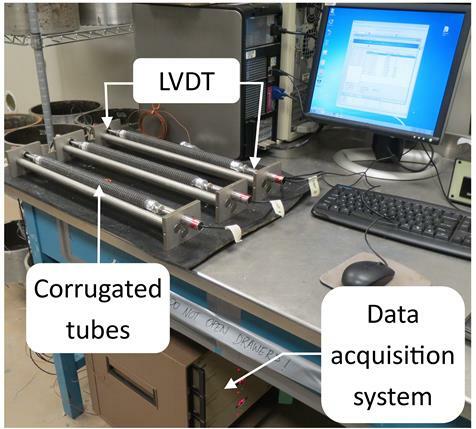 (16,17) Figure 7 shows the autogenous (sealed) deformations of these grouts measured from the time of final set to 7 d of age using the corrugated tubes test setup (ASTM C1698). 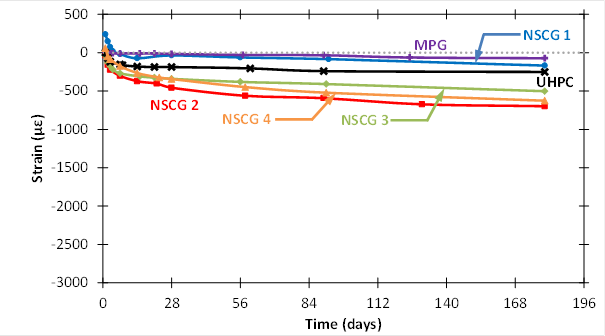 As can be observed, some of the grouts exhibit only shrinkage (NSCG 2, NSCG 3, and UHPC), others show an initial expansion followed by shrinkage (NSCG 1 and NSCG 4), and the other exhibits a slight (thermal) expansion and then a stable behavior (MPG). The long-term autogenous shrinkage deformations are shown in figure 8, where it can be seen that some of the grouts (mainly the NSCGs) exhibit shrinkage values greater than 500 με, sufficient to assume autogenous shrinkage cracking. The additional effect a drying environment has on the shrinkage is shown in figure 9, with deformations at least 1,000 με larger in the NSCGs. 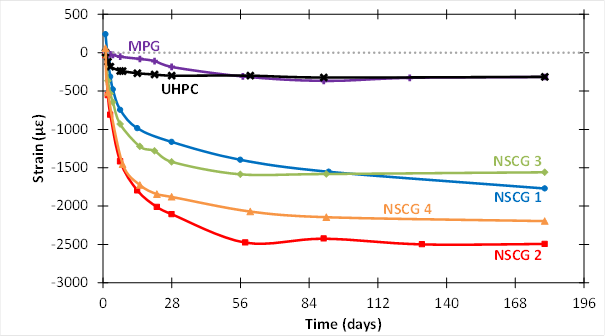 Both MPG and UHPC exhibit much lower shrinkage deformations than any of the NSCGs. C1698 corrugated tubes test at 1 d for each of the grouts. ASTM C157 (drying at 73 ºF (23 ºC) and 50-percent relative humidity). It is interesting to note that while both MPG and UHPC showed height reduction when tested in accordance with the methods described in ASTM C1107, these two grouts showed considerably lower shrinkage deformations when tested according to ASTM C1698 and ASTM C157. (3,16,17) A different contradiction was observed in the three NSCGs, which showed expansion when tested via ASTM C1107 methods but a considerable amount of shrinkage when tested following the ASTM C1698 and C157 test methods. It is then important to recognize that the ASTM C1107 test method may sometimes provide an incomplete picture of the level of shrinkage that a grout material may exhibit, which is a key parameter for a proper dimensional stability characterization. Considerable amounts of both autogenous and drying shrinkage have been reported in cementitious grouts. (9) This is not uncommon because the cement hydration reaction involves shrinkage, and, thus, it is expected that any material that includes cement or any other cementitious material exhibits shrinkage. (18) This is the reason many cementitious grouts are designed with expansive agents (e.g., ettringite) with the intent to counteract that shrinkage. However, the initial expansive effect will eventually diminish and will be followed by the (inherent) shrinking behavior of the cementitious materials. To avoid these issues, the introduction of internal curing (IC) for cementitious-based grouts is presented as a potential shrinkage reduction strategy. IC has gained interest during recent years within the concrete community. It is a technology that has shown multiple benefits in terms of concrete durability, especially from the perspective of the desire to reduce shrinkage cracking. (19,20) The concept supporting IC is the supply of highly porous particles (e.g., prewetted lightweight (fine) aggregates (LWAs), superabsorbent polymers, etc.) to the grout mix that will serve as internal reservoirs that will store water within the matrix. 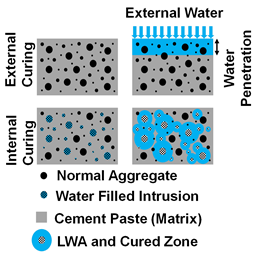 Over time, these reservoirs will release the water when negative pressure occurs in the cement matrix as a result of the formation of voids caused by the chemical reactions that create shrinkage. This process will provide a more homogeneous curing of the grout, particularly for lower permeability (i.e., low water-to-cement ratio) cementitious materials that are more difficult to externally cure. A conceptual illustration of IC is provided in figure 10. It has been observed that when IC constituents are added to cementitious grouts, the autogenous and drying shrinkage behaviors can be restricted, and the expansive nature of the binder (due to, for instance, ettringite formation) can become more effective at maintaining dimensional stability (figure 11). Figure 10. Illustration. IC concept and comparison with conventional (external) curing. corrugated tubes test at 1 d for each of the grouts. Cementitious grouts are often prepackaged by suppliers, and, when used in volumetrically large pours, the grouts are commonly “extended” through the addition of small aggregates (e.g., pea gravel). IC can be introduced to extended grouts by using LWAs rather than normal weight aggregates. The primary reason for using IC is to reduce shrinkage, especially during the first days when the tensile strength of the material is still low. In addition, this strategy might be helpful in improving curing conditions in some locations where conventional (i.e., external) curing is difficult or impossible to implement. Besides reducing the autogenous and drying shrinkage, IC can also have cost benefits because the cost per yielded volume of LWA is less than the cost per yielded volume of grout (solid fraction). In other words, when extending a grout with LWA to yield 1 yd3 (0.76 m3) of material, less solid grout is needed, thus decreasing the overall material unit cost. ASTM C1107 refers to two other ASTM test methods to characterize the dimensional stability of grout-like materials. (3) These are ASTM C827 and ASTM C1090 for early (up to final set) and later (from 1 to 28 d) characterization, respectively. (13,14) Both of these test methods have a series of shortcomings that should be further considered when evaluating dimensional stability of grout-like materials, the main one being that both methods consider the simultaneous occurrence of several parameters that affect dimensional stability. This allows a qualitative performance comparison, rather than a quantitative assessment of shrinkage and expansion propensity. The experimental details in the tests also have shortcomings. To provide a more direct correlation to shrinkage and potential cracking issues in these types of materials, the use of additional test methods is recommended, such as those described in ASTM C157 and ASTM C1698. (17,16) These methods assess pure autogenous and drying deformations (i.e., expansion and shrinkage), which might be more directly related to the real-world performance of these materials. Finally, IC is recommended as a convenient strategy to reduce shrinkage deformations and, consequently, shrinkage cracking. The inclusion of IC in prebagged grout materials could be implemented in the field as a grout extension or even as part of the premix material. This would also facilitate curing operations, especially in difficult-to-access locations. Culmo, M.P. (2009). Connection Details for Prefabricated Bridge Elements and Systems. Report No. FHWA-IF-09-010. Federal Highway Administration. Washington, DC. Federal Highway Administration. (2006). Decision-Making Framework for Prefabricated Bridge Elements and Systems (PBES). Report No. FHWA-HIF-06-030. Federal Highway Administration. Washington, DC. ASTM C1107. (2014). Standard Specification for Non-Shrink Packaged Dry, Hydraulic-Cement Grout. ASTM International. West Conshohocken, PA.
Weber, V. (1978). Joint Sealing Method. U.S. Patent No. 4,098,047. Shannag, M.J. (2002). “High-Performance Cementitious Grouts for Structural Repair.” Cement and Concrete Research, 32(5), 803–808. Graybeal, B. (2012). Construction of Field-Cast Ultra-High Performance Concrete Connections. Report No. FHWA-HRT-12-038. Federal Highway Administration. Washington, DC. Krishnamoorthy, T.S., Gopalakrishnan, S., Balasubramanian, K., Bharatkumar, B.H., and Rao, P.R.M. (2002). “Investigations on the Cementitious Grouts Containing Supplementary Cementitious Materials.” Cement and Concrete Research, 32(9), 1395–1405. Graybeal, B. (2013). Material Characterization of Field-Cast Connection Grouts. Report No. FHWA-HRT-13-042. Federal Highway Administration. Washington, DC. De la Varga, I. and Graybeal, B.A. (2014). “Dimensional Stability of Grout-Type Materials Used as Connections Between Prefabricated Concrete Elements.” Journal of Materials in Civil Engineering, 27(9), 04014246. ASTM C1437. (2013). Standard Test Method for Flow of Hydraulic Cement Mortar. ASTM International. West Conshohocken, PA.
ASTM C939. (2010). Standard Test Method for Flow of Grout for Preplaced-Aggregate Concrete (Flow Cone Method). ASTM International West Conshohocken, PA.
ASTM C109. (2013). Standard Test Method for Compressive Strength of Hydraulic Cement Mortars (Using 2-in. or [50-mm] Cube Specimens). ASTM International West Conshohocken, PA.
ASTM C827. (2010). Standard Test Method for Change in Height at Early Ages of Cylindrical Specimens of Cementitious Mixtures. ASTM International. West Conshohocken, PA.
ASTM C1090. (2010). Standard Test Method for Measuring Changes in Height of Cylindrical Specimens of Hydraulic-Cement Grout. ASTM International. West Conshohocken, PA.
Di Bella, C. and Graybeal, B.A. (2014). 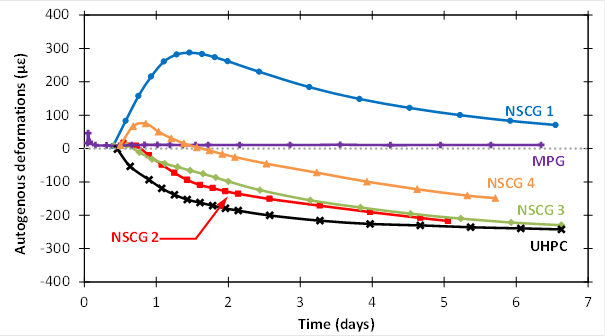 “Volume Stability and Cracking Potential of Prebagged, Cement-Based Nonshrink Grouts for Field-Cast Connections.” Transportation Research Record: Journal of the Transportation Research Board, 2441(1), 6–12. ASTM C1698. (2014). Standard Test Method for Autogenous Strain of Cement Paste and Mortar. ASTM International. West Conshohocken, PA.
ASTM C157. (2014). Standard Test Method for Length Change of Hardened Hydraulic-Cement Mortar and Concrete. ASTM International. West Conshohocken, PA.
Mindness, S., Young, J.F., and Darwin, D. (2003). Concrete, Second Edition, Pearson Education, Inc., Upper Saddle River, NJ. Bentz, D.P. and Weiss, W.J. (2011). Internal Curing: A 2010 State-of-the-Art Review. U.S. Department of Commerce. National Institute of Standards and Technology. Gaithersburg, MD. Kovler, K. and Jensen, O. (Eds.) (2007). Internal Curing of Concrete. Reunion Internationale des Laboratoires et Experts des Materiaux, Systemes de Construction et Ouvrages. Bagneux, France. Researchers—This document was prepared under the direction of Benjamin Graybeal at the FHWA Turner-Fairbank Highway Research Center. The document content was prepared by Igor De la Varga under laboratory support contract DTFH61-13-D-00007. For additional information, contact Ben Graybeal at (202) 493-3122 or at the FHWA Office of Infrastructure Research and Development, 6300 Georgetown Pike, McLean, VA, 22101-2296. Distribution—This TechNote is being distributed according to a standard distribution. Direct distribution is being made to the Divisions and Resource Center. Key Words—Accelerated bridge construction, prefabricated bridge elements, grout-like materials, dimensional stability, shrinkage, internal curing. Notice—This document is disseminated under the sponsorship of the U.S. Department of Transportation in the interest of information exchange. The U.S. Government assumes no liability for the use of the information contained in this document. The U.S. Government does not endorse products or manufacturers. Trademarks or manufacturers’ names appear in this TechNote only because they are considered essential to the objective of the document. Keywords: research, structures, Accelerated bridge construction, prefabricated bridge elements, grout-like materials, dimensional stability, shrinkage, internal curing.